On RTÉ’s Marian Finucane show, Ms Finucane interviewed actress Sinead Cusack who is also People Before Profit TD Richard Boyd Barrett’s mother. After Ms Cusack gave birth to Mr Boyd Barrett in 1967, he was adopted by Valerie and David Boyd Barrett in Dun Laoghaire. Ms Cusack and Mr Boyd Barrett were reunited some years later. I wish to lodge a formal complaint against RTE for breach of its Public Service Statement 2015. 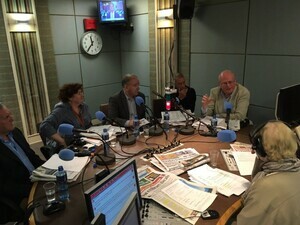 My complaint centres on the biased panel selection on the Marian Finucane Show as broadcast on Sunday, 4 September last. Specifically, my complaint concerns the unbalanced and unchallenged views expressed during the discussion surrounding the Apple tax scandal. Michael McDowell: Independent Senator and former Tanaiste and Minister for Justice. Patsy McGarry: Irish Times Religious Affairs Correspondent. Diarmuid Ferriter: Professor of Modern History at UCD. It is reasonable to describe all the panel members and the presenter, Ms Finucane, as individuals with conservative views that are mainly in line with the governing establishment. It is also reasonable to describe the two politicians on the panel as public representatives with strong and uncompromising views on the political outlook of those who oppose the Government’s response to the Apple tax scandal. Left wing political parties such as Sinn Fein, Anti-Austerity Alliance, People Before Profit and others who represent a significant percentage of the population were, by their exclusion, prevented from expressing a contrary view. This is in breach of RTEs Public Service Statement 2015. Ensuring its treatment of current affairs and matters of public controversy, in addition to being impartial and objective, is fair to all interests. It is also clear that RTE management is very well aware of the major changes taking place within Irish society. RTÉ today sits within a society, economy and media environment that is changing; and changing rapidly. Recent years have shaken public confidence in institutions and traditional authority. Despite this awareness, or perhaps because of it, RTE management seems to be abandoning its objectivity and professionalism in favour of taking the side of State/Government. The apparent packing of a discussion panel in favour of one side of the debate is also in breach of RTEs duty in law to be impartial. RTÉ has a duty in law to be accurate, fair and impartial, and to remain independent from all state, political and commercial influences. Posted in Misc and tagged Anthony Sheridan, Apple tax, Complaint, Marian Finucane Show, RTE at 11:58 am on September 19, 2016 by Broadsheet. it was an awful interview. ms cusack wasnt impressed. Why is it reasonable to describe them as as individuals with conservative views that are mainly in line with the governing establishment? For example, what has Patsy McGarry said that would make you think that? If this person is assuming that based on his title, I am guessing he doesn’t read too many pieces by John Waters tormentor. You’re talking about tiny parties there, nothing like the size of FF and FG so your point is mute. You’re also ignoring the 10 percentage point drop in support for FG and the almost 13 percentage point drop in support for Labour. Basically the incumbents took a hammering and the opposition parties made big gains. Point is certainly mute, if you’re saying that the one in five of the population who voted for these ‘tiny’ parties are muted by not having their views represented on air. It’s not moot, which is probably what you intended to say. 1. What is the point of the Sinead Cusack thing. let’s pretend for a second that all of us don’t have time to listen to every piece of radio media looking for outrage, what exactly is the problem with that? Broadsheet have to keep track of every time their PBP favourites are mentioned on the radio and every time their PBP favourites are *not* mentioned on the radio. You do a good job keeping track of your blueshirt pals. It’s a tough job, but someone’s got to do it. How many times has Sinead Cusack actually acted one the stage in Ireland over the last 35 years? Twice? OK, her Da was Cyril, but so what? Marianas Finucane is a terrible interviewer and presenter. Forget, for a moment, what she’s paid or whether she’s a nice person, she’s a really poor presenter and this kind of ramblind, turns out to be offensive shorthand is par for the course with her. No she isn’t. I think she’s a pretty good radio presenter. Can’t agree with that rotide. She frequently appears uninterested or unprepared and often asks questions already answered. she used to be years ago on deh liaveline…I heard that interview and it was carcrash, she telegraphed where she was going with the interview, Cusack saw it and shut her down with the old “sorry the lines dead schucghhchhhh hello hello” routine and during the break to fix the line Marian got straightened. it was a fail. and very funny too. She’s rubbish. Does no research prior to the show, sounds bored, hacks up phlegm, coughs into the mic, has her cronies on every time. She needs to be put out to pasture. She’s had her go at the trough. How to make your own Marian show – for this you will need two centre right politicians, one developer (or a former banker if you don’t have a developer in the fridge) , a journalist of the sensible persuasion and a past member of the PDs. Now whisk into a wheezy cocktail of consensus and allow (your listeners) to simmer for two hours. Then fupp off on holiday for half the year. It’s purgatory for developers. 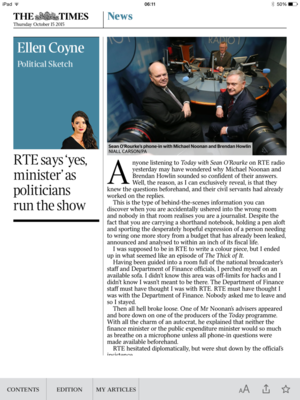 A chance to redeem themselves at licence fee payers expense, thanks to Marian. I can see from your Twitter timeline you appear to be anti-water charges. Why have you not complained about RTE discussing this topic using only politicians on panels and never, ever, having hydrologists, geographers etc give their opinions ? Cause their professional opinions would be almost entirely irrelevant to how we pay for water, which is a political issue. It’s a political issue because RTE can’t put up a presenter/interviewer who’s got anything other than a soft arts degree. PS can I just say BREXIT for no reason at all – it appears to be the fashion. I think we can all agree, no matter what our political persuasion, that Marion is worth every penny she’d paid. Copps must have been in North Korea on her holidays because she’s usually on every 15 minutes on Radio SIPTU, sorry I mean RTE. Or what people get up to in the bedroom. But on money matters THERE. IS. NO. ALTERNATIVE. If Sinead Cusack had have made a different “choice” and booked herself into an abortion clinic Richard Boyd Barrett wouldn’t be here today. That’s something he should be told to his face the next time he call for the repeal of Ireland’s eight ammendment! Why are you italicising ‘choice’?Why the assumption that every woman can’t wait to have an abortion,and why do you talk as if having the option would make it mandatory?